Happy New Year's Eve!!! 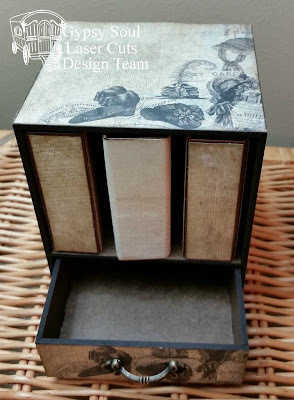 To end the year out, I have a quick and easy project for you; the Mini Album Display Case. 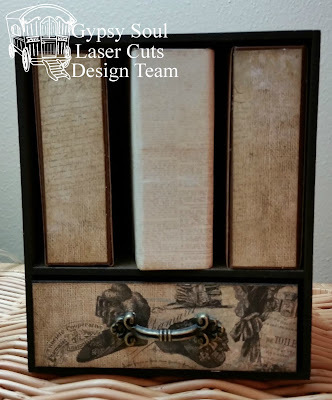 The kit includes the display case with a drawer and cover pieces with spines to assemble four mini albums. 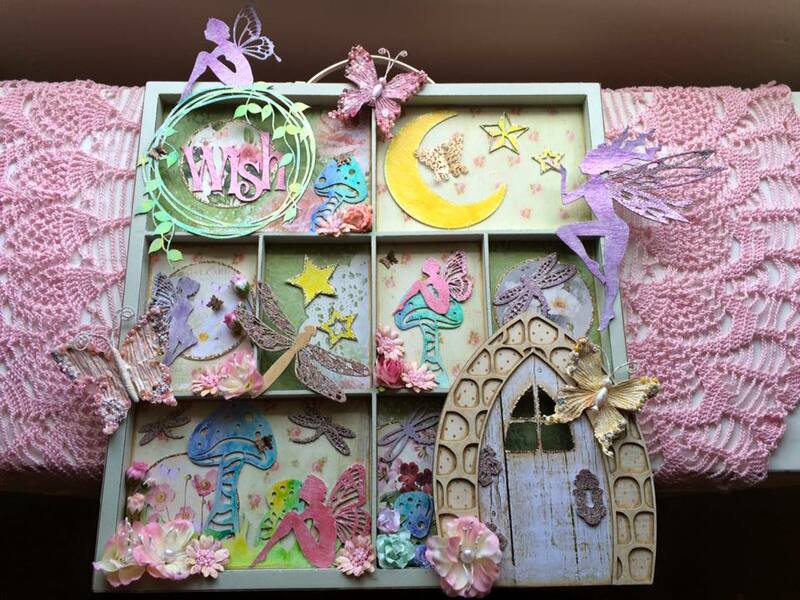 The display box and drawer are in the fabulous hardboard. 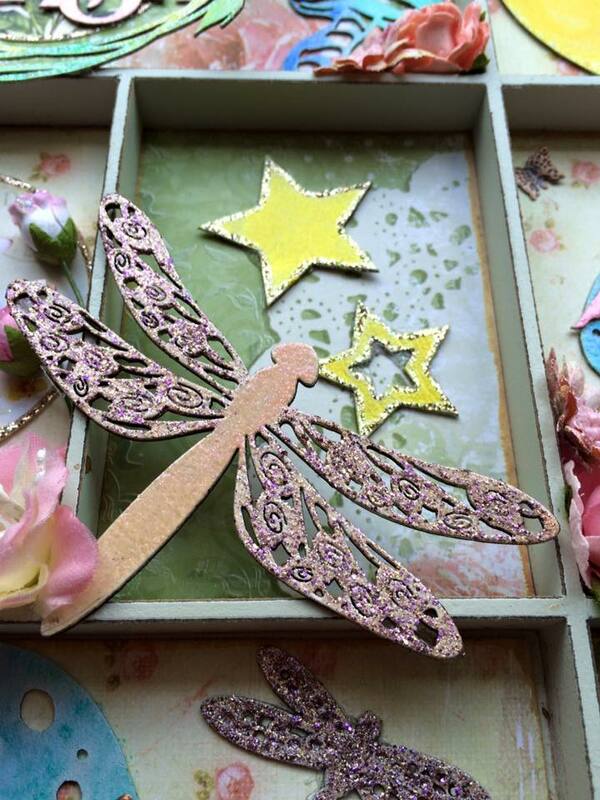 The mini album pieces are laser cut from chipboard. 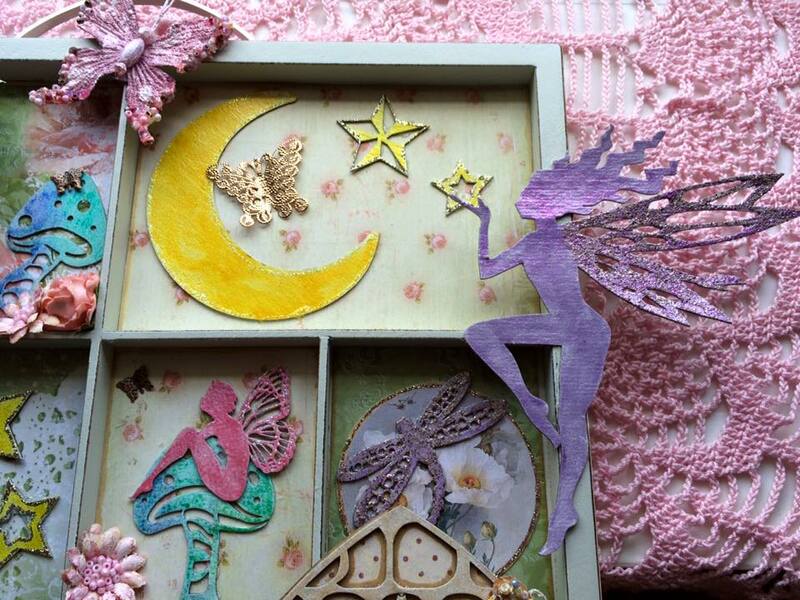 After the case and drawer were assembled and glued, I applied paper from the paper stack "French Kiss" from Glitz. The metal handle was from my stash. I only assembled three of the four mini albums since I was not sure how I wanted to use them. This also allowed space for me to decorate the front covers. 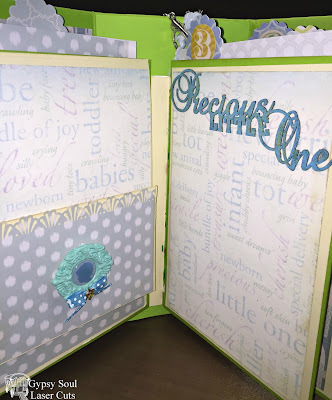 Until I figure out what I want to store in this great case/mini albums, I am going to use it as a home decor piece! The assembled cabinet measures 5-1/2 inches tall by 4-1/2 inches wide by 4-1/2 inches deep. 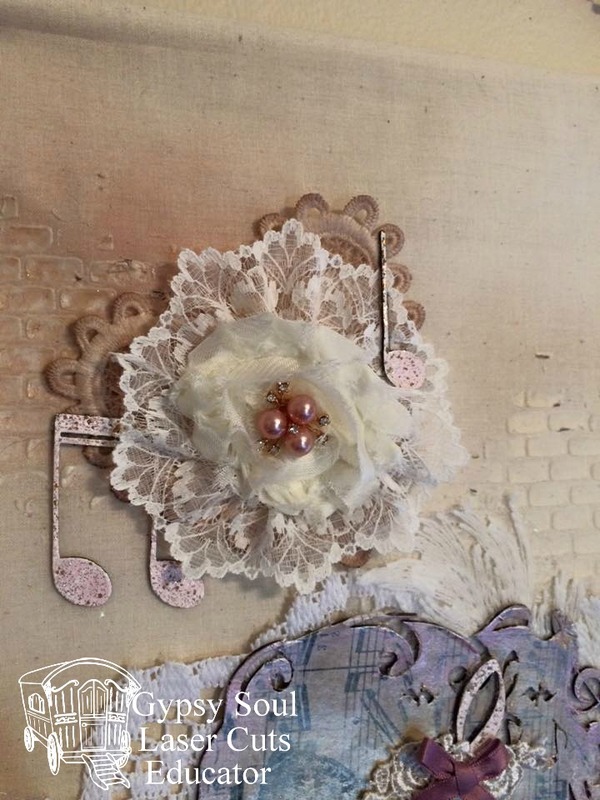 The mini album covers measure 3-1/2 inches tall by 4-1/4 inches wide. and the spines measure 1-inch wide by 3-1/2 inches tall. 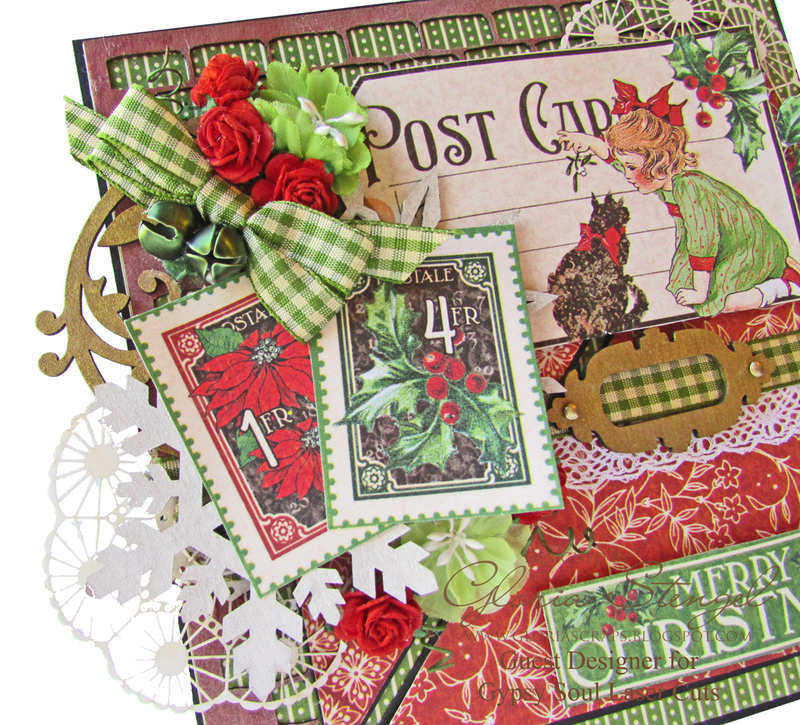 Hi everyone, Dianna here with my last holiday season post for 2015. 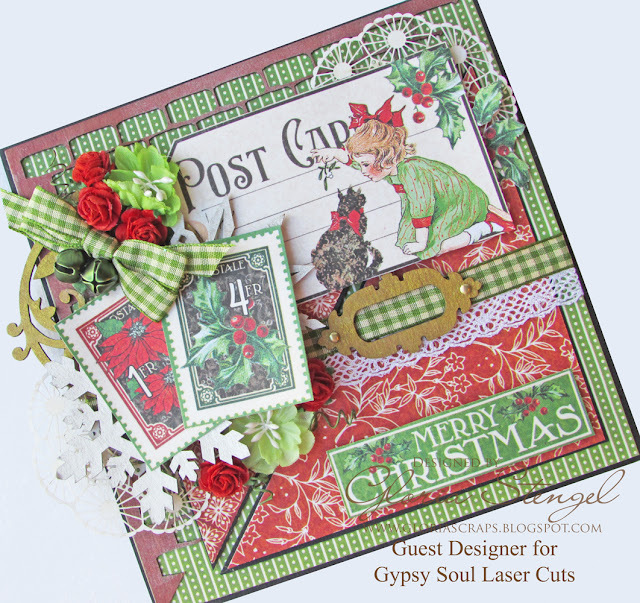 I used a new 2016 product from Gypsy Soul Laser Cuts, a Square Shrine Shadowbox, and used Graphic 45's "A Christmas Carol" to create a winter wonderland in a box. 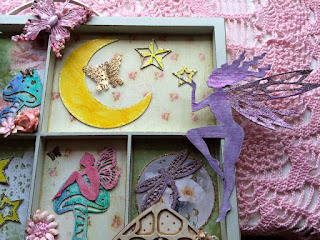 First I dry assembled Gypsy Soul Laser Cuts - Square Shrine Shadowbox (coming soon in 2016), then I painted it with white gesso. I wanted a semi-covered look so a streaking effect is what you want. 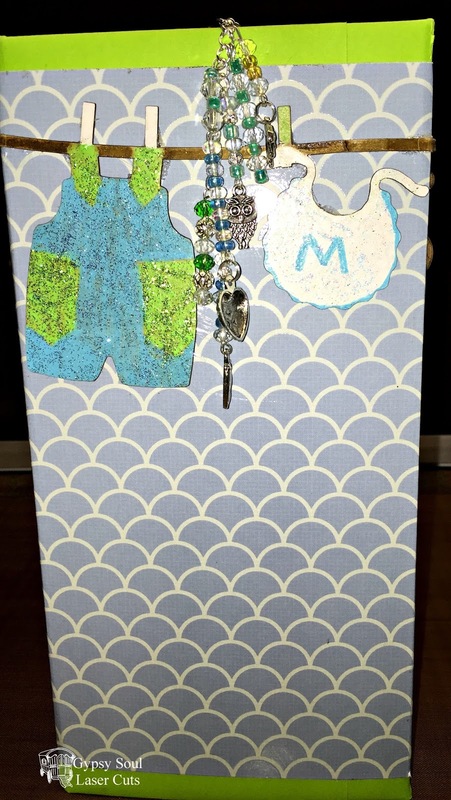 I used white and diamond Stickles all over the outside of the box. 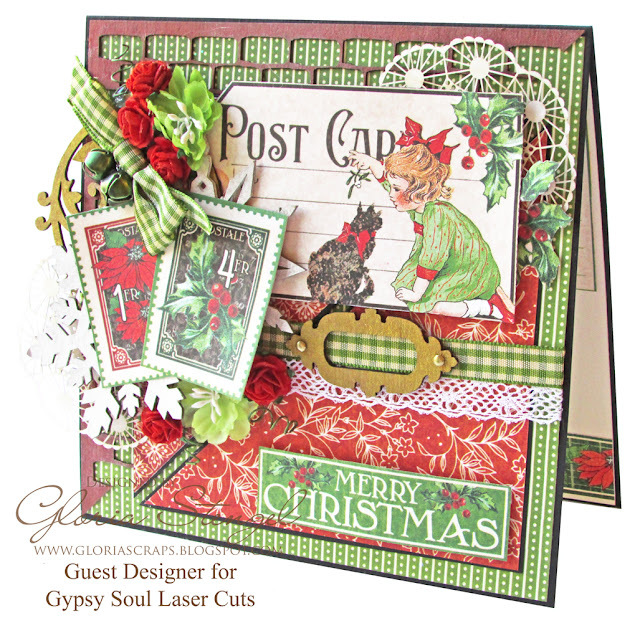 Then I fussy cut Graphic 45's "A Christmas Carol" (8x8 pad). 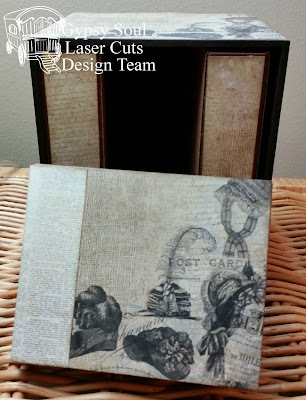 I cut up two sheets of the title page so that I would be able to create a pop up affect. I used old sheet music for the back ground and tore up on of the snowing pages from Graphic 45. 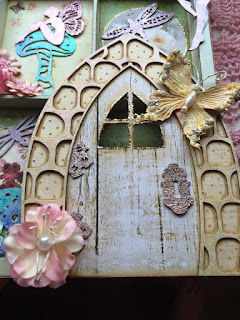 I then used drop off from Gypsy Soul Laser Cuts chipboard to layer the church and houses. I then used a snow pen for the roofs. After the snow dried, I used Stickles on the snow. You cannot see it but the sleigh is actually only half of a sleigh on the paper but I hid that with the carolers being the highest pop up. I used a highlighting pen on all of the paper. I fussy cut the flowers, tag and postcard from Graphic 45's "A Christmas Carol" 8x8 pad. A bit of scrap string finished the tag. Thank you for looking. Hi everyone! Amylove here excited to bring you my next project. I decided to marry my two favorite mediums; fabric and mixed media. I love the way it turned out and looks beautiful on my wall. Hi! Let's make one thing clear. Although I love snowmen, I am NOT a fan of snow at all! I'm really enjoying our mild green Christmas here in southwestern Ontario and I probably should have asked Gina to custom-design a "let it MELT" word piece for my project!! However I had a wonderful time creating this little guy and I thought the word piece from the Winter Shape Set suited him perfectly! I used the Artist Trading Blocks and covered each of them with torn paper using Mod Podge for a collage effect then attached them in a stack.I brushed the surface randomly with a little more Podge and sprinkled clear glass glitter on it. The word piece was painted with acrylic paint then stamped and heat-embossed with clear embossing powder. 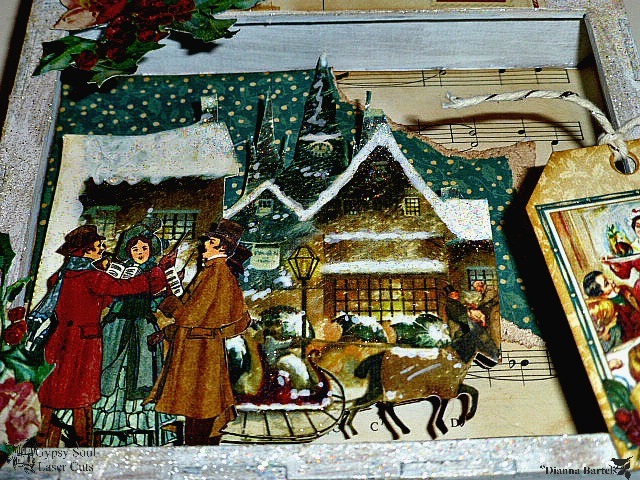 The snowflake on that piece and on the hat were painted .white then sprinkled with the glass glitter. The tree was painted then stamped and heat-embossed and then I tried out a really cool product that was new to me - the Marvy Uchida Snow pen! I drew the snow on with the pen then let it sit for a few minutes before applying the heat tool and voila - 3D puffy snow! Now I want to run around putting (pretend) snow on everything! The eyes are adhesive pearls coloured with a Sharpie and the arms are little branches from one of the sycamore trees in my yard; the hat and scarf were rescued from a worn out snowman decoration I had. Whether you're up to your waist in the cold white stuff or baking in summer heat (or anywhere in between) I hope you enjoyed my little snowman. Have a super day and thanks for stopping by! Hello friends! 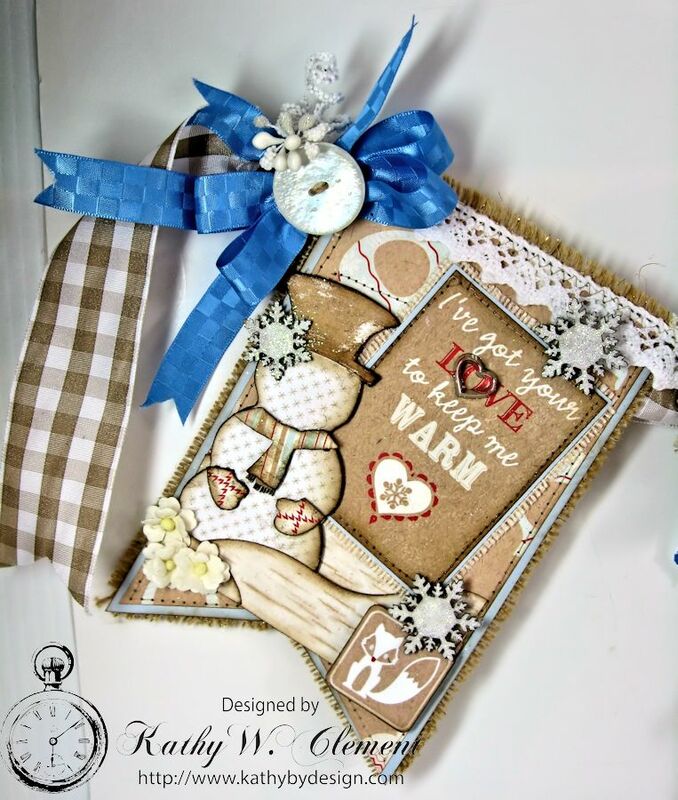 This is Debbie sharing some fun inspirational tags using Gypsy Soul Laser Cuts Filigree Frames Shape Set. With the new year coming on a little inspiration is something most people are looking for. I altered the Chipboard by simply inking it with chalk ink in an aqua color. Next step is to Ink the edges with a chalk ink using a chocolate brown. The final step is to rub with Inka Gold in Copper. Simple tags with a great message. Hi everyone! 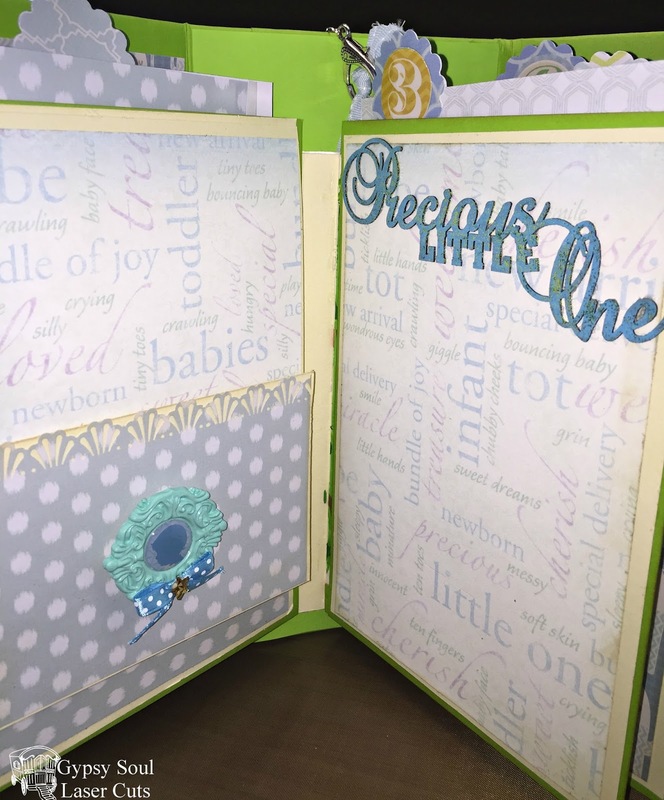 I have a baby boy mini album using an old Cheese-It box and Gypsy Soul Laser Cuts. 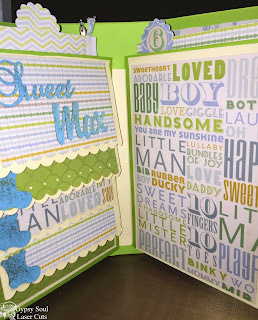 I started with Gypsy Soul Laser Cuts Baby Boy Clothesline Set. I used paint markers in blue in green then after the paint dried I used Stickles to make it pop. 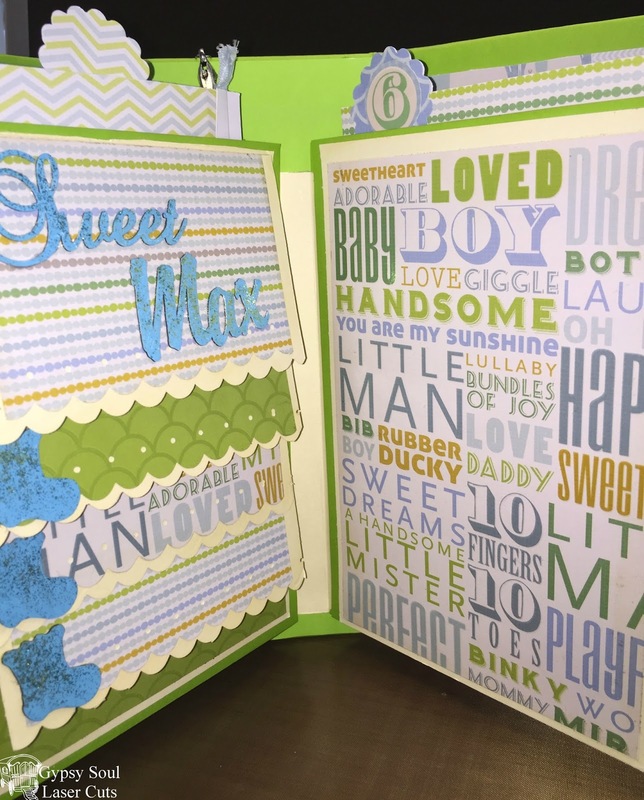 I then requested a special order from Gypsy Soul Laser Cuts for the Baby Max. I covered the Cheese-It box with green paper, then I added the ribbon to close it. After the ribbon, I then covered the green paper. I created the spine by cutting 4 x 6 inch strip then score it at one inch at both ends, a 3 x 6 inch strip then score that at one inch on both ends, finally a 2 x 6 inch strip, score at 1/2 inch on both ends. Then I stacked all of the strips on top of each other and glued them. I then cut the bottom and top of all of then ends at a angle so that the pages will glue in. 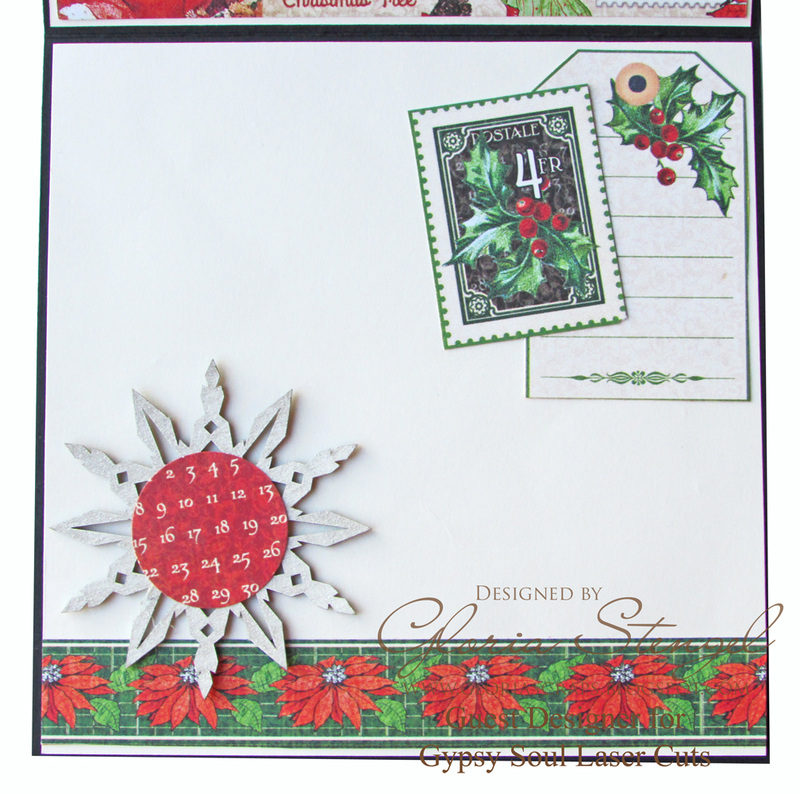 I punched out the scalloped circles and added the years to the top of the inserts which are 3 x 5. 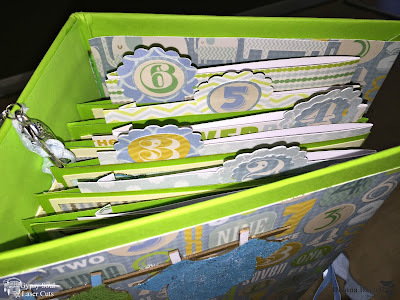 I then cut six pages at 8 x 6 and scored at the 4 inch part to create the fold to glue to the spine. 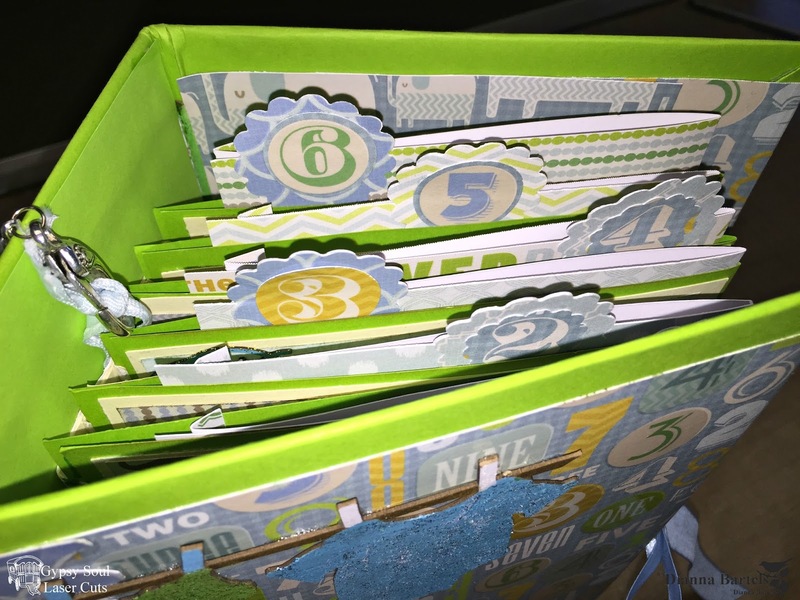 I created the pocket by folding a 8 x 4 inch paper and gluing the pocket to the page. 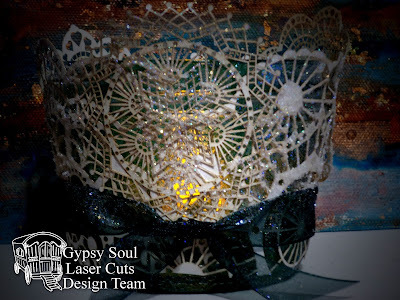 I painted Gypsy Soul Laser Cuts Precious Little One from the Words and Phrases 2 blue and used white Stickles. I created a water fall by using the scrap paper. I then used the booties from the Baby Boy Clothesline Set and the Sweet Max from my special order and painted them blue. After they dried I used white Stickles. The last thing that I did was create a tassel charm using blue and green beads. The overalls and bib are the end pieces from the Clothesline. Thank you for looking! Hello lovelies!!!! 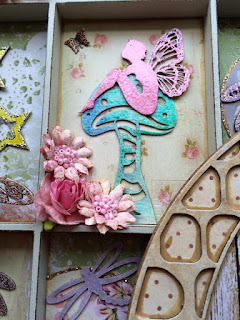 Shanna here with cards to share.bI wanted to make something bright and fun and I thought I should play with some texture sheets from Gypsy Soul Laser Cuts. What do you think??? 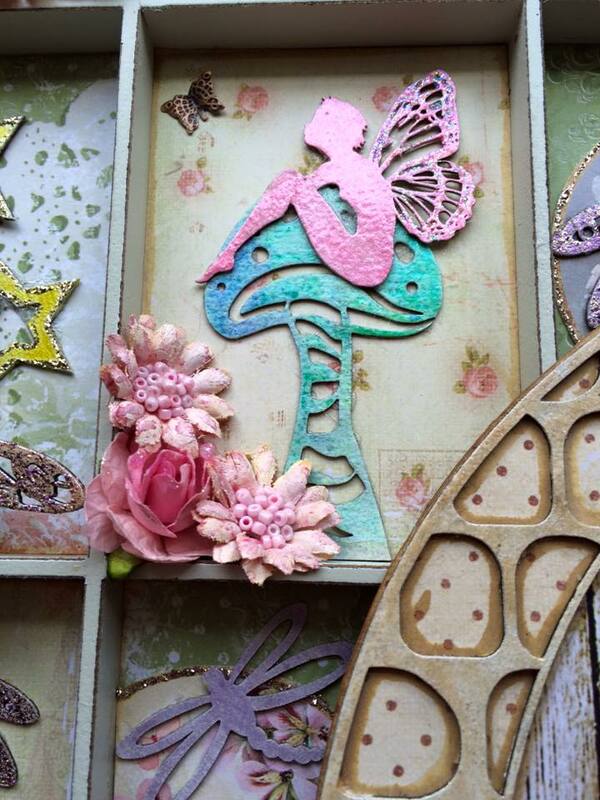 This is my first card I created and I painted my chipboard with gesso first. 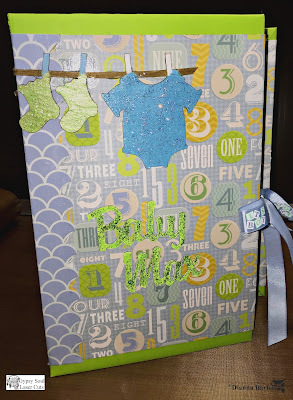 I also used a Cardstock Doily from the store. 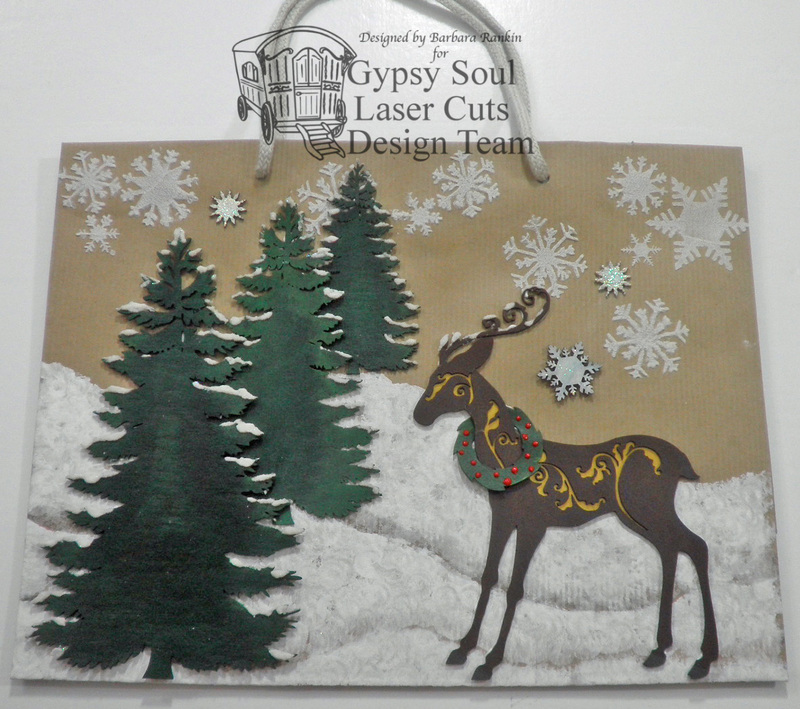 I created my own mist and sprayed the chipboard after the gesso dried. I used a heat gun to dry the mist so it had this watercolor look to it. Do you see the shimmer? For my second card I had actually used some paper to clean up the blue spray and thought why not tuck it behind my other gesso covered chipboard. I think the white just pops off the card. 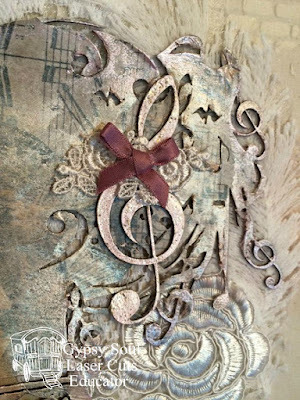 I wanted to finish this card off with a rustic key I created with a few layers of Silks Acrylic glaze paint that was dried with a heat gun in between layers. Merry Christmas Readers! I hope that you are blessed today with peace and joy, and friends and family. I am featuring a Christmas Card today, on this most special of days! 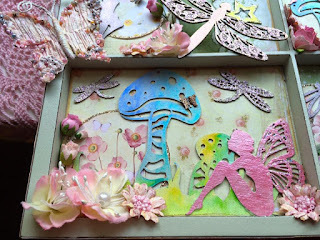 I love using chipboard layers with other embellishments. I find you can really load up a card this way! I love the beautiful, vintage vibe of this card. I makes me smile! I am digging into the NEW Graphic 45 Children's Hour paper, and my, it's beautiful! I used the Brick Wall 2 background for my card. I inked the brick wall sheet with red ink and then sponged on a bit of white. I wanted the card to convey the feeling of stockings hung by the chimney with care! I also used one of the shapes from the Delicate Frames and Ornaments Shape Set (inked with gold ink), two large snowflakes from the Snowflake Shape Set (sprayed with white paint mist), and a bookplate from the Miniature Bookplates Shape Set (inked with gold ink) for embellishment. 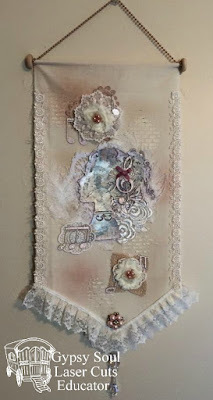 I tucked a doily from the Cardstock Doily Set - Intricates around the edges. 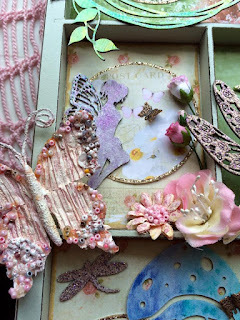 I cut the doily in half and used both parts on the card. As always, I decorated the inside of the card! 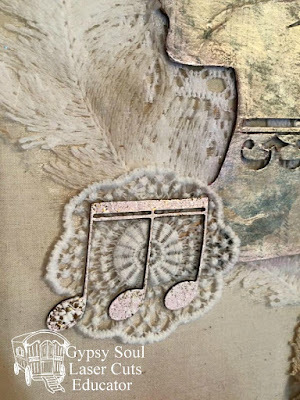 I had an extra snowflake, so I added it to the inside and then embellished it with part of a calendar image. 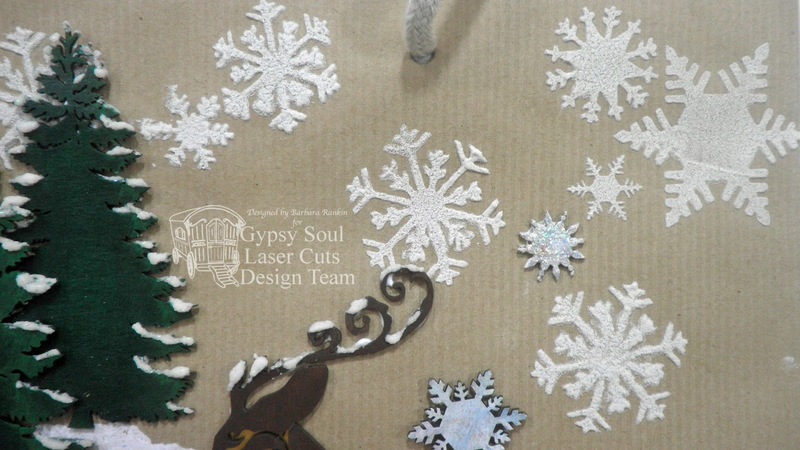 I cut the image with a circle punch to make a "button" for the snowflake! I hope you enjoyed this last Christmas card of the year! Merry Christmas, everyone! Barbara here with my last post for this year, and I thought and thought about what I would like to share with you. Then it came to me. I want to give each and every one of you a bag full of blessings and good wishes for the new year. 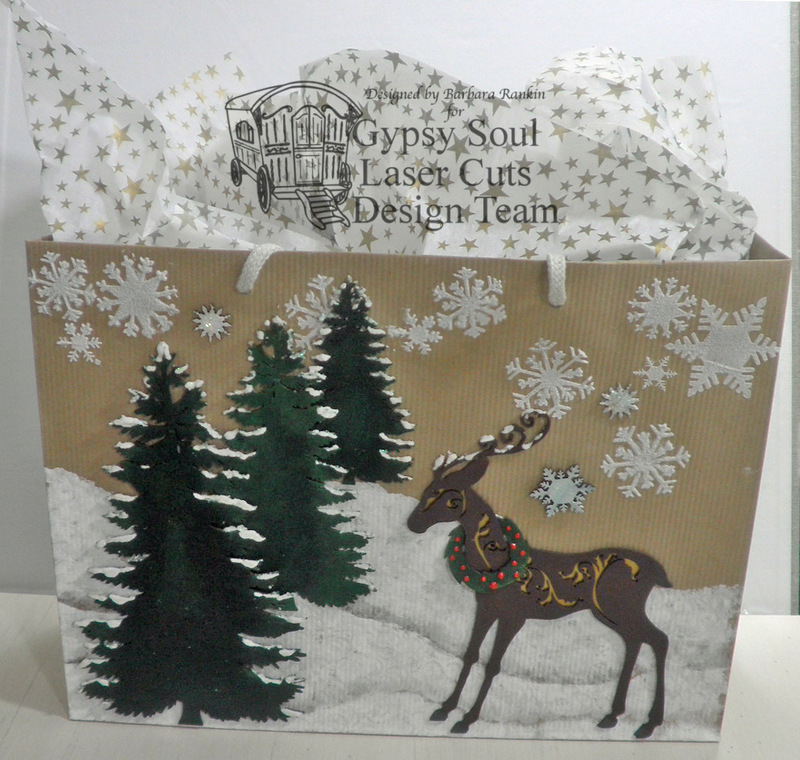 So, I needed something to put them in, and what better way to present them to you than in a beautifully hand-decorated gift bag. 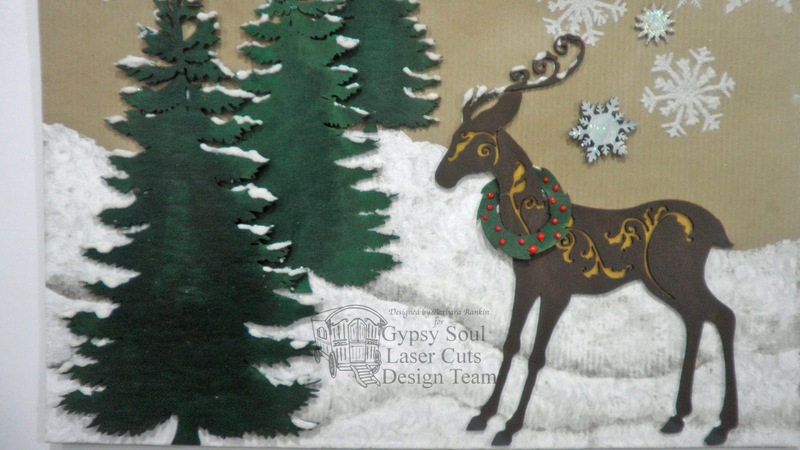 As you know, Gypsy Soul Laser Cuts is chock-full of fabulous designs to help you with all of your crafting needs. And here is just one example. I started with a plain, ordinary brown gift bag. Nothing special, but I hope you will agree that I managed to turn it into something quite nice, and it was so easy. I made this in an afternoon, including paint drying time. CLICK HERE for a short video tutorial of this quick and easy process. Here are a few closeups of the bag. Be sure to stop by the Gypsy Soul Laser Cuts blog tomorrow to see more inspiration from the design team, and check out the fabulous chipboard in the shop. There is always something new. Thanks for stopping by, and have a very Merry Christmas and a wonderful New Year! 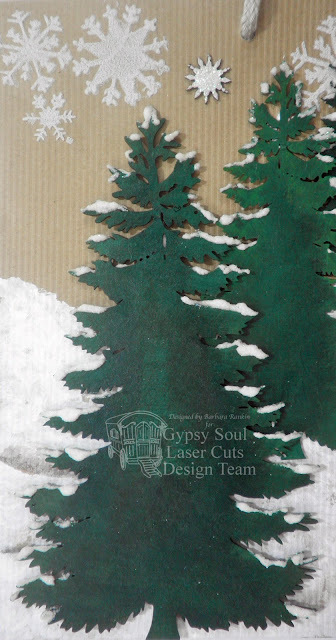 I spent a delightful afternoon playing with Authentique's Cozy paper collection and chippies from Gypsy Soul Laser Cuts Winter Shape Set. 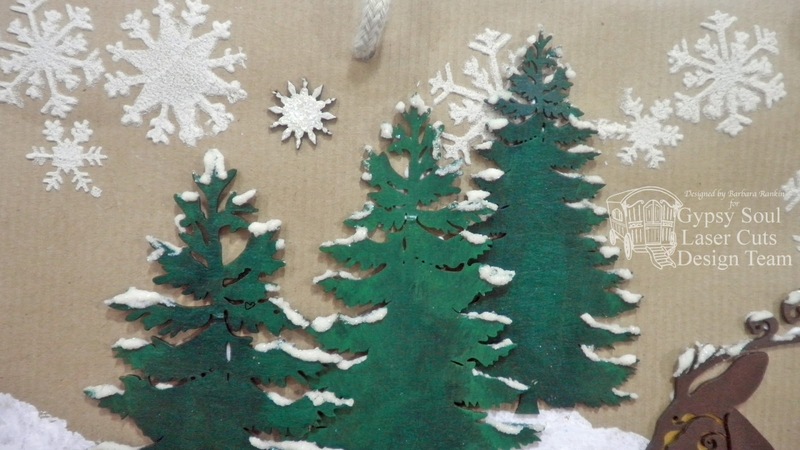 Making a Cozy Winter Banner is a great way to chase away the post-Christmas blues! 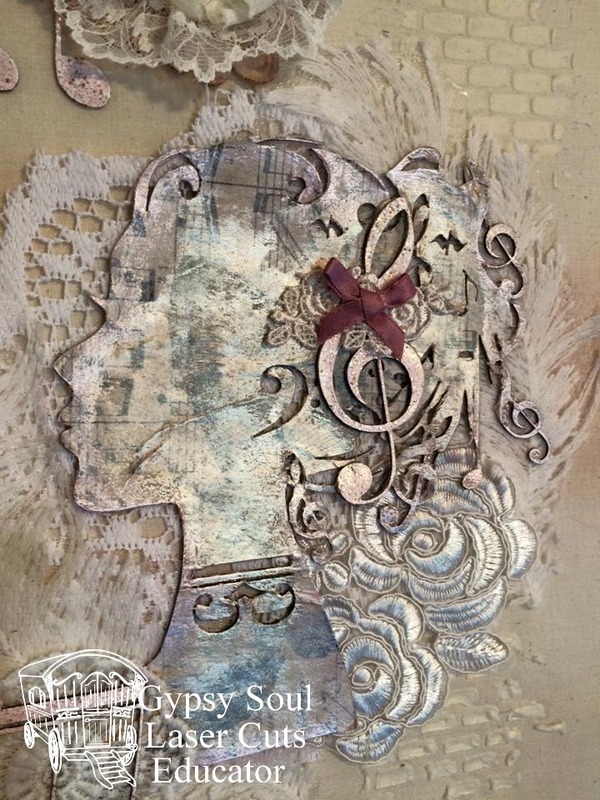 I did a little experimenting with paper piecing on this project. One of the great things about working with high quality chippies is that you can alter them in any number of ways. 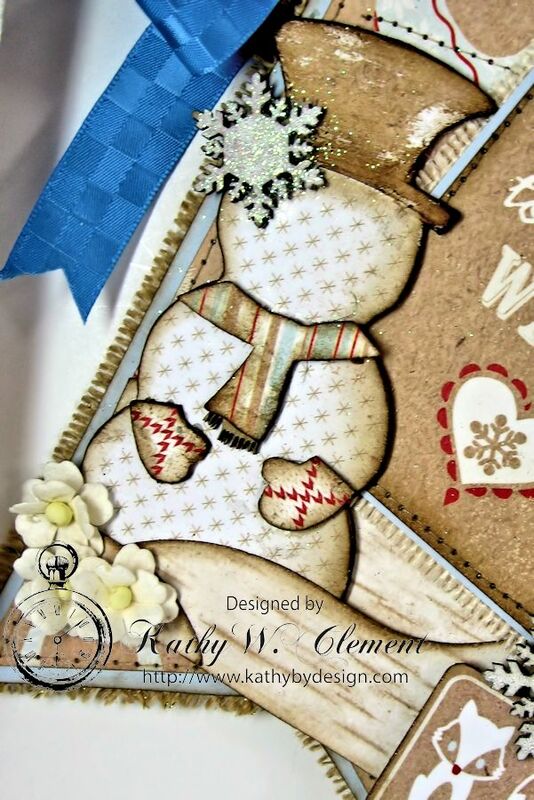 For this dapper snowman, I traced around the snowman chipboard, then cut it out, inked the edges of my paper with Vintage Photo Distress Ink and glued it onto the chipboard base. I sanded off any excess paper, inked again and look just look how cute he is! I used this same process for the mittens, hat and scarf, using different patterns from the paper collection. 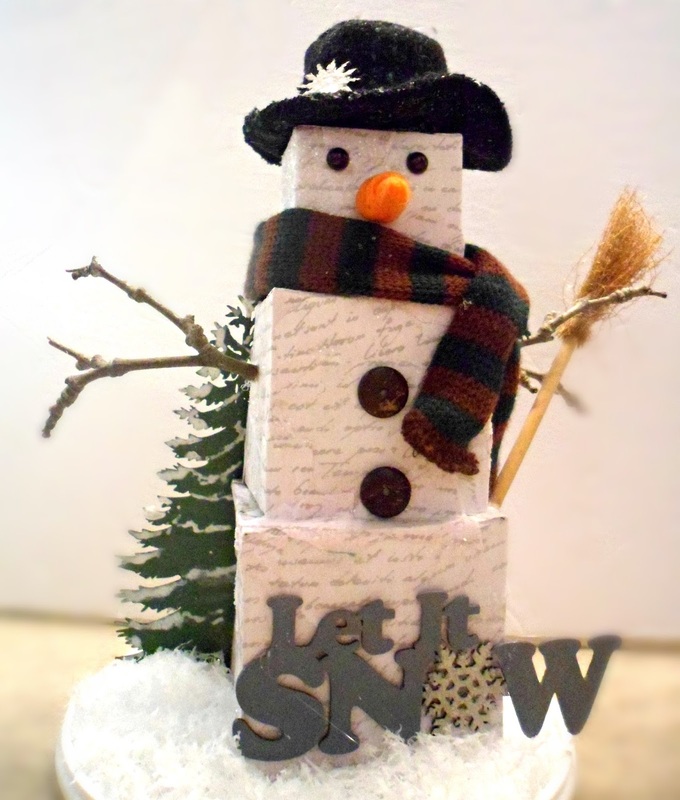 So if you are afraid to paint, this is a great option for solid shapes like this snowman! 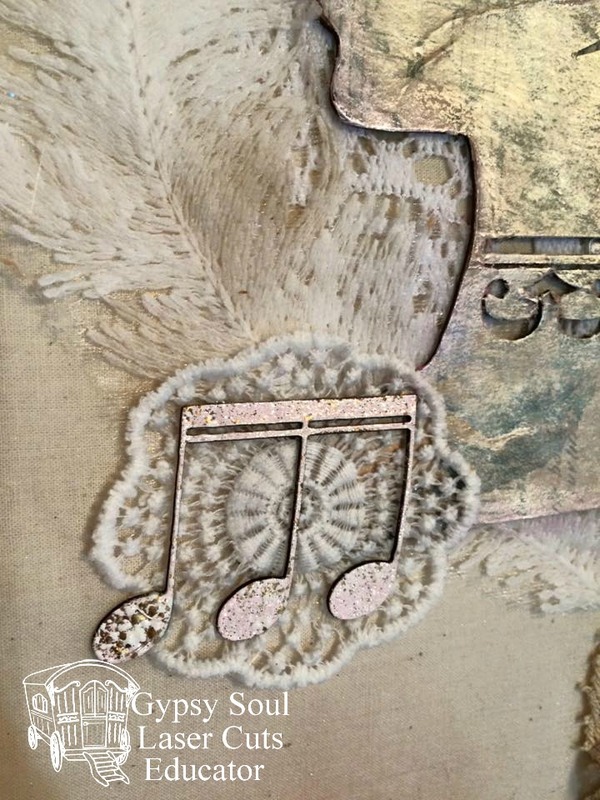 Here's a close up so you can really see all the fun detail this technique allows you to add to your chips. 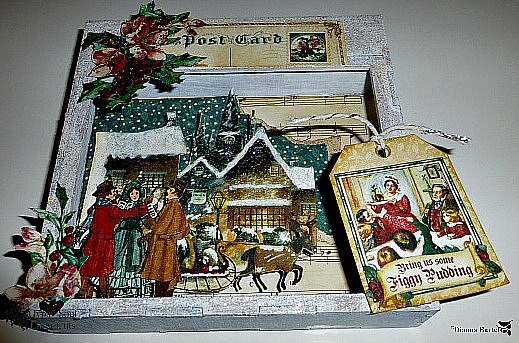 I painted the snowflakes with Picket Fence Distress Paint, and then sprinkled them with glitter while still wet. I even glued one onto the top hat once it was dry. The "snow drifts" were created with a cutting die, and I just tucked Mr. Snowman right in there to make him look like part of the scenery. Because the snowflakes in this set are loaded with amazing detail, I opted to paint them and then add some sparkle with a little glitter. 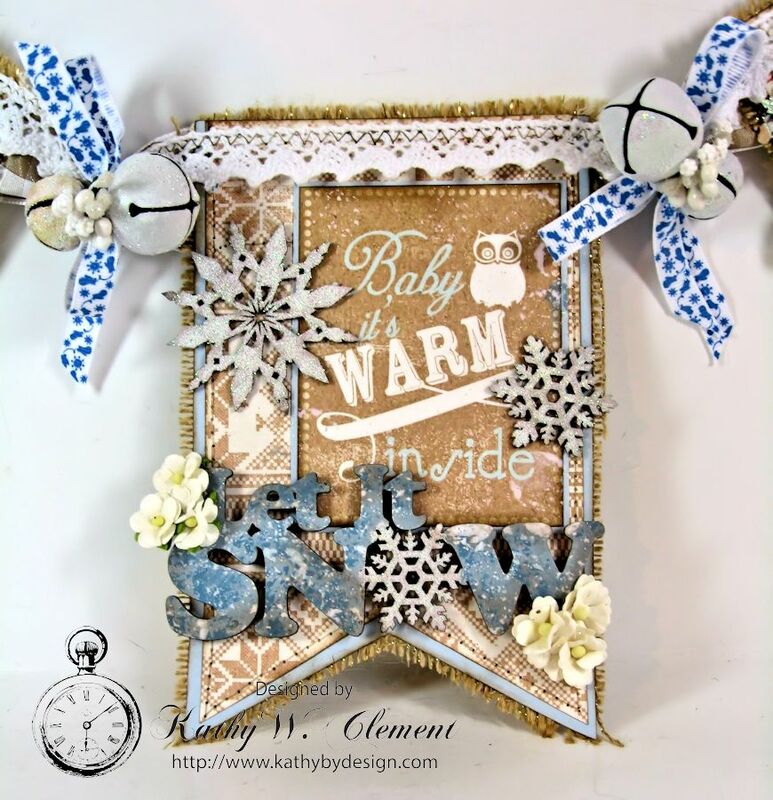 For the chipboard title on this pennant, I painted just the snowflake, and once it was glittered and dried, I went back with Stormy Sky and Weathered Wood Distress Paint to add just the right shade of blue to the lettering. The edges were inked with Vintage Photo DI, and then I just lightly tapped the letters with Picket Fence paint to give them a snowy appearance. Simple, but effective! 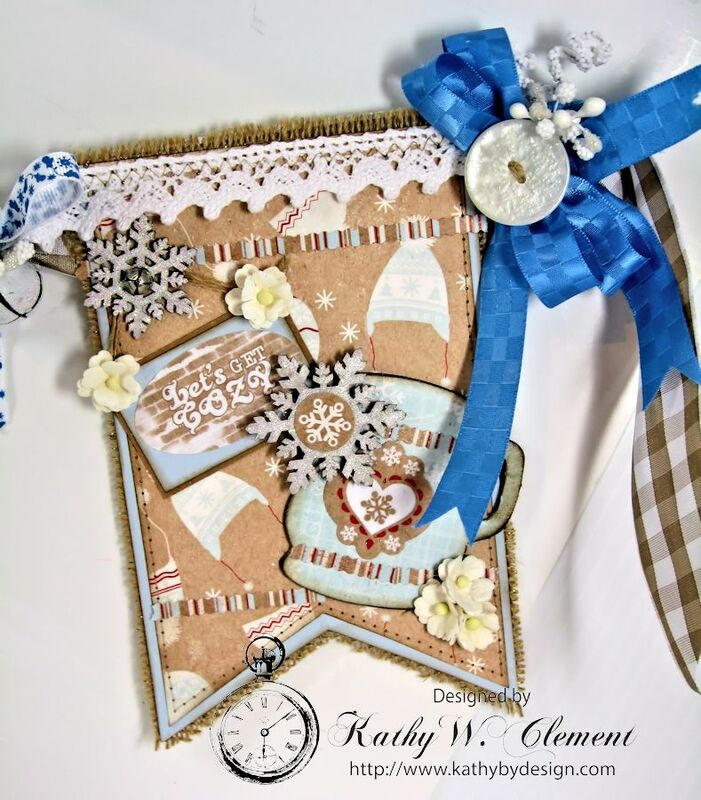 I love how quick and easy it is to alter chipboard, and I love having the ability to custom color it to match the papers I used on this cozy winter banner. This mug of cocoa was paper pieced as well. I just traced around the mug onto my designer paper, then added some cute sticker strips and a big sparkly snowflake to finish it off. I really love the way this turned out! 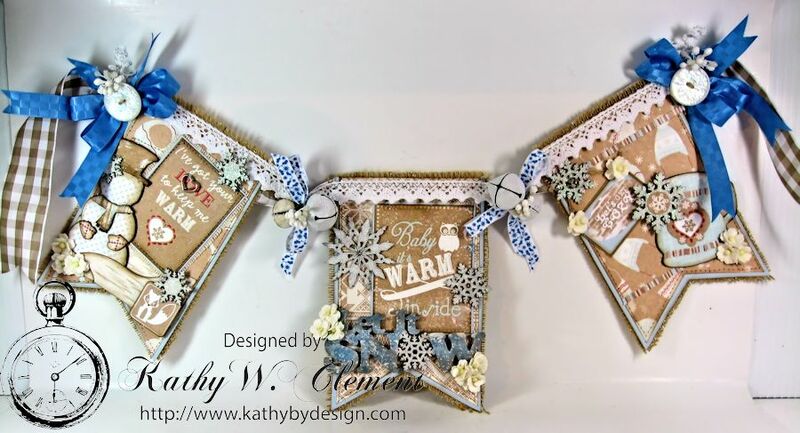 Each pennant on this cozy winter banner measures about 4.5" x 6.5". I freehand cut them, matted them on blue card stock and then stitched them to pretty burlap. Then I just stitched them onto pretty Antique Gold Gingham ribbon, adding a strip of crocheted lace as I sewed along. 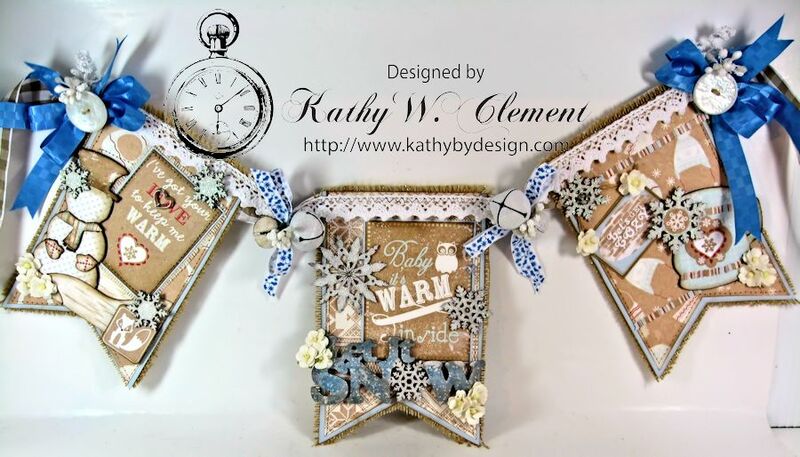 Add some poufy blue bows, painted white jingle bells, vintage buttons and mulberry flowers and you've got a warm and cozy banner that will keep you smiling all winter long! 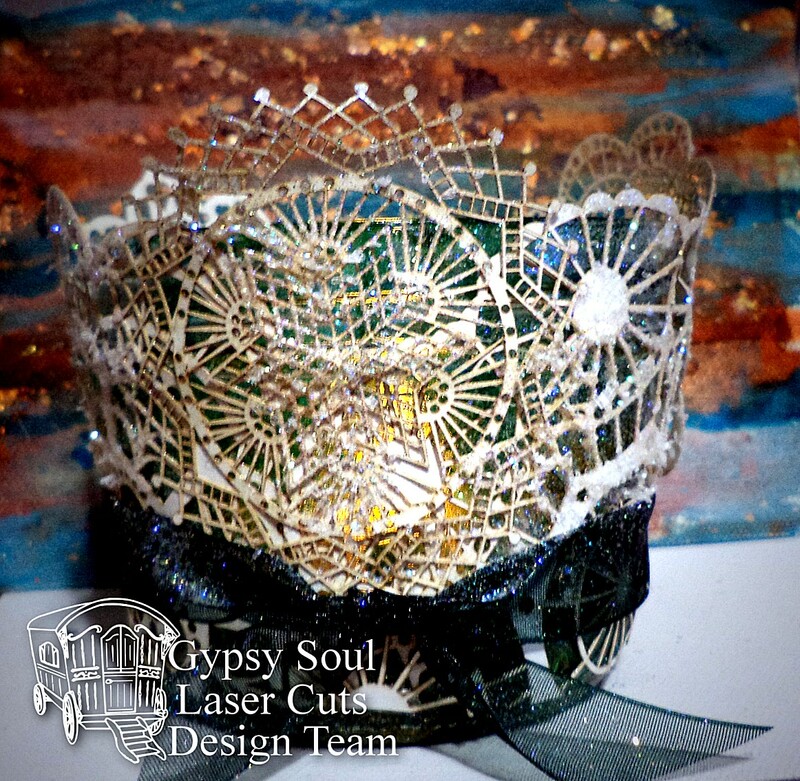 I've had so much fun serving as a guest designer for Gypsy Soul Laser Cuts this month, and I hope I'll be back in 2016! Thank you for letting me share with you all this month. I hope you've had as much fun as I have! 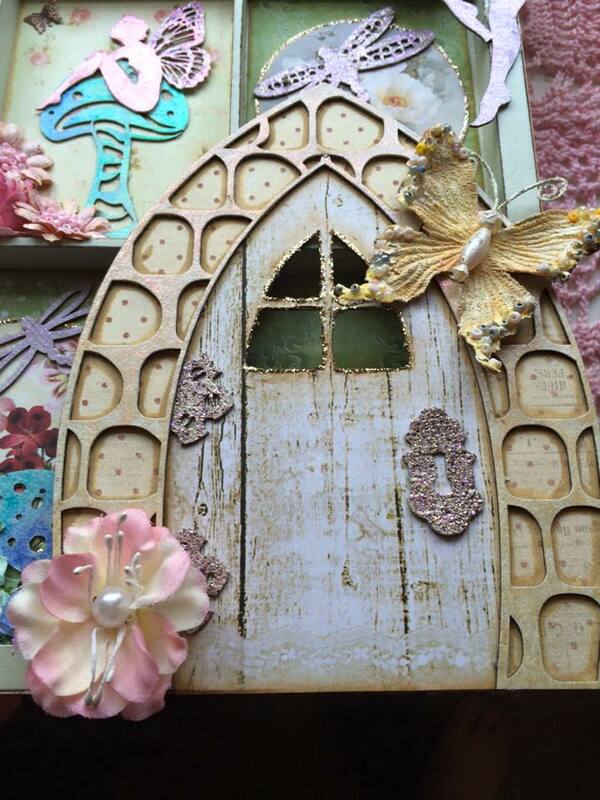 You will surely see more chipboard in my designs, as I love the dimension and texture it adds to a project. Yup...I'm hooked! And with Christmas just 48 hours away, I'd like to take this opportunity to wish you all the merriest, happiest, chippiest Christmas ever! If you'd like to see more of my projects, I invite you to visit my blog, Kathy by Design. Thanks for stopping by! Practically nothing throws me into a panic during the holiday season like an informal, last minute invitation of, "Hey, come on over tonight!" Because what follows isn't "Oh dear, what shall I wear?!" It is, "Oh dear, what shall I bring?!" In my circles, I'm known for handmade, which is great. But when I have half an hour or so to whip up the magic? Yikes! So, here's a bit of inspiration that came out of one such moment. I began with a wide-mouth, 8-oz mason jar. I always have those around because I also like to make jellies and jams. I began by sponging StazOn Studio Glaze all over the jar. It dries fast, so by the time I picked out the doilies I wanted to use from the Cardstock Doily Set - Intricates, I was ready to continue. I cut the doilies so that the curves would come up over the top of the jar. Then I simply glued them in place. 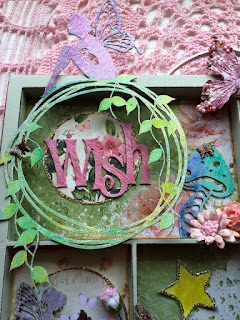 I glued smaller doilies on top of those to cover some of the bare spots. I set it aside for a minute to let the glue dry while I searched for the ribbon I wanted to use. Then I tied the ribbon with a simple knot. But, I felt like it needed a little something more. 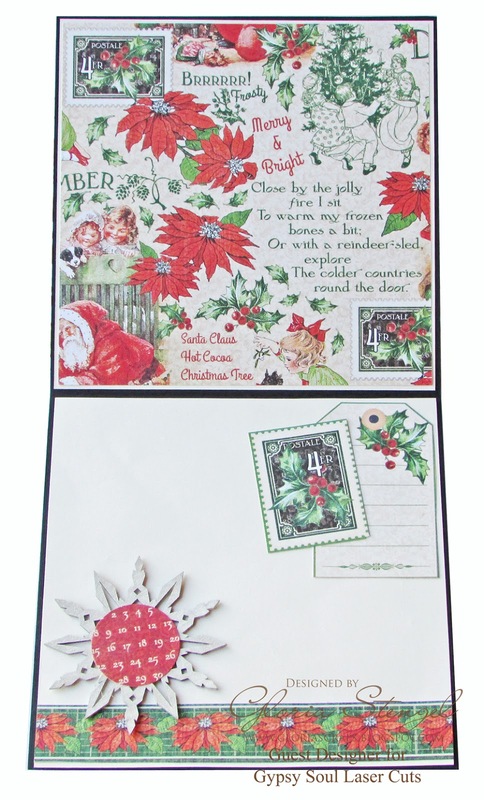 A little festive holiday sparkle, perhaps? Yes. So, I dabbed all over it with my Goosebumps Dauber and then sprinkled on fine glitter. Done! I had a cute little project to bring my hostess that night. It should be noted that I included battery-operated tea lights so as not to have open flame near the paper doilies. Tea light Snowman With Danny! December Facebook Challenge- Let it Snow!